The Idaho lease agreements are documents that allow for an individual, known as a tenant, to occupy commercial or residential property in return for payment to the owner, known as the landlord. The tenant should view the premises and if they approve of the space they should engage in negotiations over the terms and use. Once a verbal understanding has been met a contract should be devised amongst the parties. Once signed, the agreement becomes legally binding. Rental Application – To be used just before authorizing a lease as it is a way to verify the financial capability of the tenant in addition to employment, background, and previous landlord history. Commercial Lease Agreement – For any type of property or space for the use of a business activity. Lease with Option to Purchase (Lease to Own) – A common rental contract with the added provision of purchasing the property. Month to Month Lease Agreement – Referred to as a “tenancy at will” which is a contract with no end date yet according to § 55-208 may be canceled by landlord or tenant with at least one (1) month’s notice. Room Rental (Roommate) Agreement – Between the members of a shared housing situation and not with the landlord or agent of the property. Standard Residential Lease Agreement – Common twelve (12) month arrangement, although may be for any fixed period, between a landlord and tenant. Sublease Agreement – Used by a tenant who would like to rent the residence they are currently under a binding arrangement to another individual, known as the ‘sublessee’, for a period of time no longer than their current lease. Usually, the landlord’s consent is required. 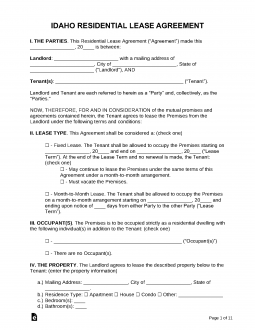 Termination Lease Letter (§ 55-208) – For the cancellation of a month to month rental contract where the landlord or tenant must give at least thirty (30) days’ notice to the other party. The State of Idaho does not require any disclosures to be attached to the agreement. Although under Federal Law, if a home/apartment/condominium was built prior to 1978 it is required that the Lead-Based Paint Disclosure Form is attached to the rental agreement. There is no State law providing that the landlord must give notice to the tenant before entering the premises for maintenance or any other issue. It should be recommended that the landlord at least give advanced notice in order to maintain a healthy landlord-tenant relationship. Maximum – There is no State cap. The landlord may ask for as much as they want from the tenant. Returning (§ 6-321) – If it does not say in the agreement the landlord must send the deposit to the tenant within twenty-one (21) days from the move-out date. However, it may be sent back up to thirty (30) days from the move-out date only if the thirty (30) day period is stated in the agreement.